For all of you Breaking Bad addicts out there, welcome to withdrawal. There are only eight episodes left in the entire series, but we won’t get another fix until the show returns for its final mini-season next summer. To send us off, we were treated to a summer finale titled “Gliding Over All” (fittingly named after a Walt Whitman poem that ends with the telling line, “Death, many deaths I’ll sing”). 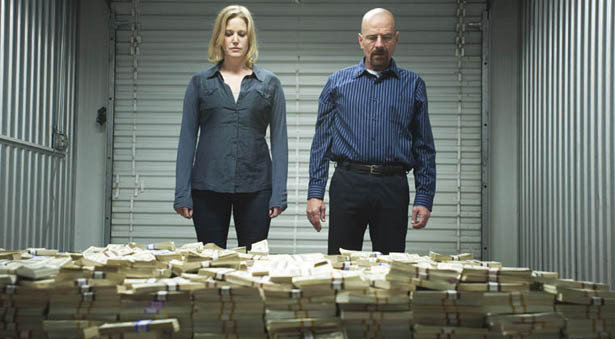 But following last week’s plot-packed installment that included Jesse’s defection and Mike’s death, this episode could have easily been entitled “Inertia,” which is Walter’s explanation to Jesse about why they didn’t use their drug money to buy a better RV when they were first starting out. Anyone expecting an explosive, action-packed finale was instead treated to a contemplative, sometimes slow hour that seems just as concerned with looking back as it is with moving forward (the risin capsule, Leaves of Grass, the hospital test, the dented paper towel dispenser, the hotel painting and the housefly that mesmerizes Walter in the opening moments are all callbacks to previous seasons). Not that the plot doesn’t progress. Todd officially takes over as Walter’s new right-hand man, Lydia convinces Walter to spare her life and let her take his operation global, Walter orchestrates the prison killings of Mike’s men, and Jesse finally gets his $5 million. And the sluggish first half gives way to some major revelations in the final act: Walter abruptly quits the business, which (of course!) is when Hank discovers Gale’s inscription in Walter’s book and realizes that one of those “monsters” he’s been chasing is his own brother-in-law. Just when Walter thought he was out, they pull him back in. -Is there a better looking show on TV right now? Director Michelle MacLaren should win a boatload of Emmys for this episode’s stunning visuals, from the gruesome prison sequence to the time-lapse skylines to the riveting meth operation montage that was expertly stitched together with match cuts. -Speaking of Emmys, the show’s sound director also deserves kudos. What a wonderfully macabre choice to use Nat King Cole’s jaunty “Pick Yourself Up” to soundtrack some of the most brutal prison killings ever seen on the small screen. And using Tommy James & the Shondells’ peppy “Crystal Blue Persuasion” for the meth montage was pure genius. -It will be interesting to see how Jesse gets pulled back into the action for the final eight installments. Aaron Paul was only in two briefs scenes in this episode, and the show was poorer for it. -Let’s hope next year’s summer premiere picks up seconds where we left off. What will Hank’s reaction be? Will he come barging out of the bathroom with his pants around his ankles and his gun drawn, or will he decide to help cover up Walter’s secret (which he himself has benefitted from, albeit unknowingly)? We can’t wait to find out!